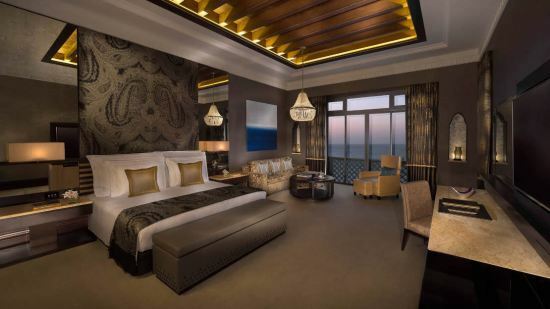 Situated on the warm Arabian Gulf, the boutique resort Jumeirah Mina A'Salam is a pocket of tranquility, and the gateway into the majestic Madinat Jumeirah complex. Families and business travellers will revel in the exclusivity, top-class dining experiences, boutique shopping and galleries plus a collection of bars. Facilities such as Sinbad’s Kids’ Club and Talise Spa enhance allow for a fabulous stay for all ages. High standards of service and luxurious accommodation sets the bar high for a 5 star stay. Beautifully furnished rooms and suites offer views over the sapphire sea, and a truly decadent experience. 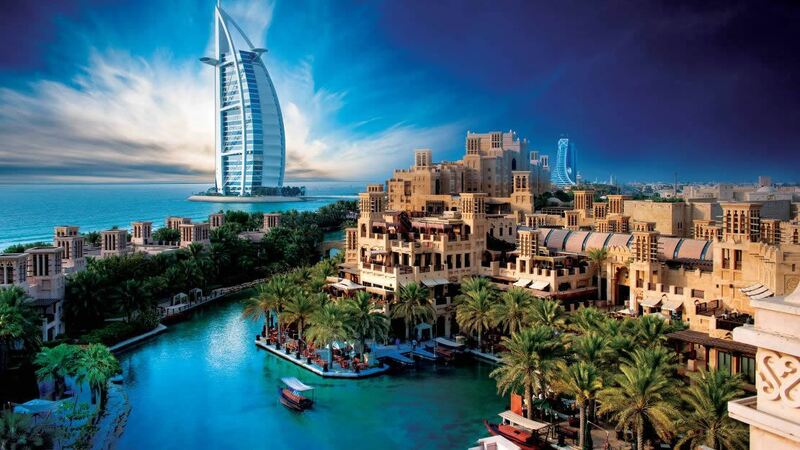 Jumeirah Mina A'Salam showcases the very best of Arabian culture and hospitality. There’s a dazzling 2km of private beach to enjoy at this hotel complex, with access to an array of water sports. 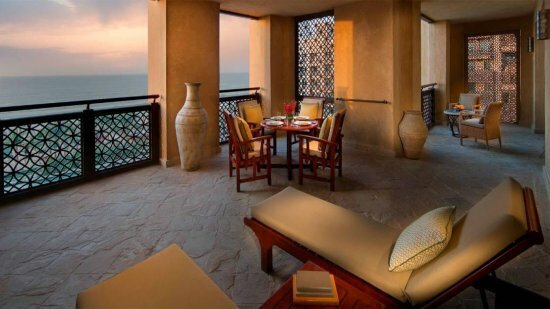 Jumeirah Mina A’Salam is part of the impressive Madinat complex. There’s an endless list of things to do, with shopping, restaurants, bars, a spa, water park and even a turtle rehabilitation centre as part of the experience. Exploring more of Dubai is also easy from here. Downtown Dubai, where you’ll find the tallest building in the world, alongside the Dubai Mall and water fountain show is approximately 15km away. Emirates Golf Club is about 8.5km away, and Dubai Marina is 9km. Dubai International Airport is approximately 27km away from Jumeirah Mina A’Salam. This room enjoys access to the benefits of Club Executive. With rich dark wood themes and an Arabian style, there's a luxurious feel throughout. Relax in a spacious living area, sink into a sumptuous king-bed or soak in an over-sized marble tub. 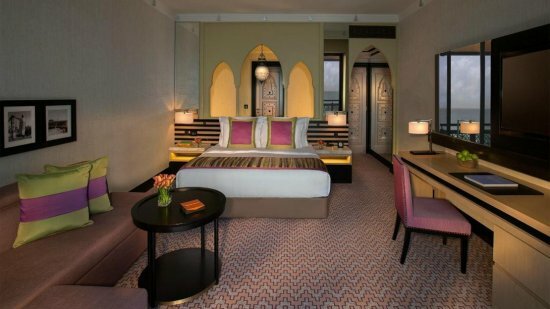 It may be the starting point of some opulent accommodation but these rooms set the bar for luxury here at Mina A'Salam. Glorious ocean views, an expansive living area and an excellent selection of amenities are available in this room type. Relax in a stunning room featuring Club Lounge and Premium Leisure Club access. The private balcony offers views over the ocean and the Middle-Eastern inspired decor of the interiors soothes and relaxes after a busy day. Extravagant and stylish, Ocean Suites are superbly decorated and include Club Executive Lounge access and Premium Leisure Club access. A sumptuous bedroom with king-bed, beautiful marble bathroom and dressing room and a fabulously spacious lounge and dining area relaxes guests after a long day. The spacious balcony offers great views of the azure sea. 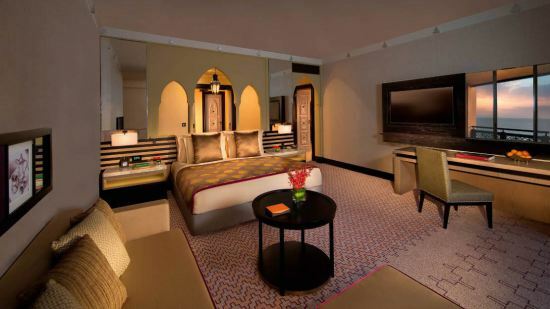 Reflecting grand Middle-Eastern style, these magnificent suites feature an array of rich finishing touches. A beautiful marble bathroom furnished with rainfall shower and separate large bath, plus a stylish dressing room combines with a fabulous master bedroom and spacious lounge. Panoramic sea views can be enjoyed from the ornate balcony and a host of privileges completes the experience. 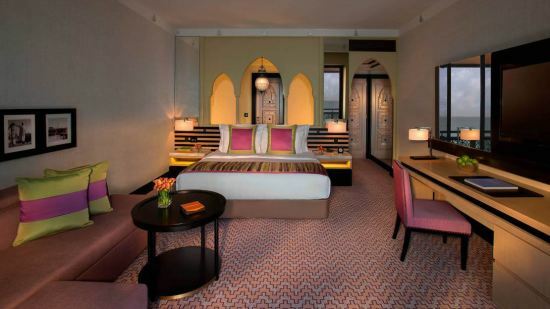 The essence of luxury in a warm Arabian style, this beautifully decorated suite boasts extravagance via an array of ornate touches and lavish art. The antique-influenced decor combines with accent colours and creates a richly decadent setting for a family to relax. There's two marble bathrooms with Jacuzzis and walk-in rainfall showers, two opulent and private bedrooms, and a study. The views from the beautiful terrace are simply stunning, looking over the resort and water gardens.